The weather was just beautiful here today. 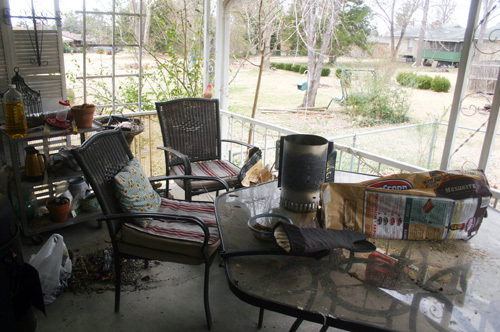 It looks like it is time to clean off the back porch and get it ready for Spring. After all, Spring will be here soon. Check out the countdown calendar! We like to grill all year round. My husband moves the grill up on the porch and he grills in all kinds of weather. He also tends to make things a bit messy. 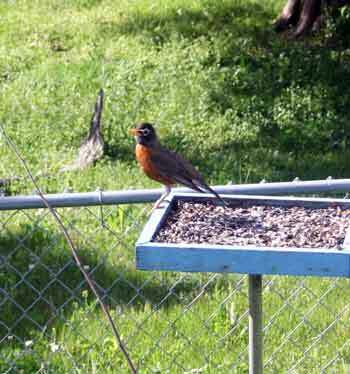 In addition to his mess, the birds have scattered seed all over the place as well. Oh well, the sunshine and pretty weather made cleaning it all up a pleasant job. Got out the broom, a trash bag and added some elbow grease! Now, that is much better. 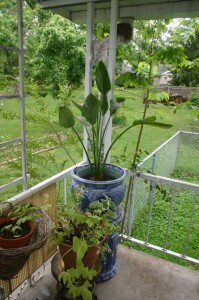 Looking forward to bringing out some of my plants that have spent the winter in the house and adding some pretty flowers. 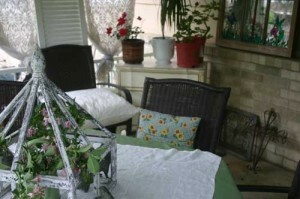 Now, when we have the pretty days, I can go ahead and sit out on the porch and enjoy! 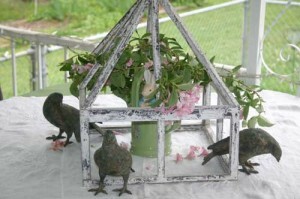 Even the doves that have spent the winter inside got to get out. I’m sure we’ll have some more cold weather before it is all over. 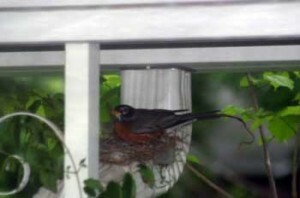 As my mama says, “We’ll still have our Easter snap.” In that case, I’ll just bring the plant in and the birds can hold down the fort until the weather warms back up. I’m thinking it is time to change the cushions in the chairs and do a little updating. I’ll let you know how things progress. Hope everyone else is having fun getting ready for Spring. Happy Monday! Have a great week! 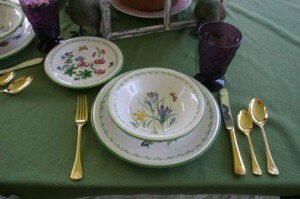 Something easy and green this week for St. Patrick’s Day! 1. Mix first 3 ingredients in large bowl. Stir in Cold Whip (thawed). May be served immediately or possibly stored for 2 to 3 days. 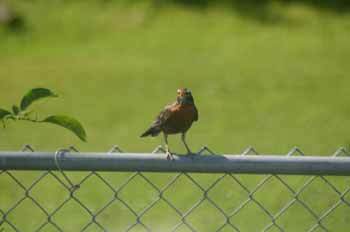 Ruby Tuesday visitors – made some revisions that didn’t get updated properly last night. Sorry, I didn’t have the link here last night. It has been corrected this morning (Tuesday). 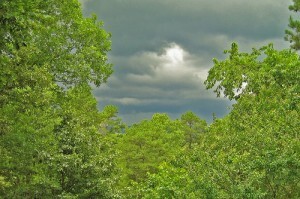 I’ve been out on the porch listening to another storm roll in. We had one earlier this afternoon and all last weekend and last week. One of the storms last week did quite a bit of damage farther south of here. Not a lot of damage other than some limbs down around here. My garden is loving the storms. All that nitrogen from the lightening is making things grow like, well, weeds! When it dries out a bit in the morning, I’ll get some pics of the garden to post. 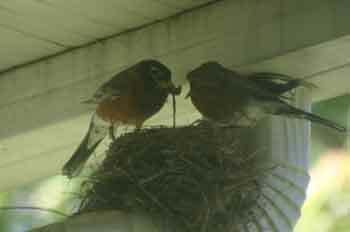 The robin babies have been back! 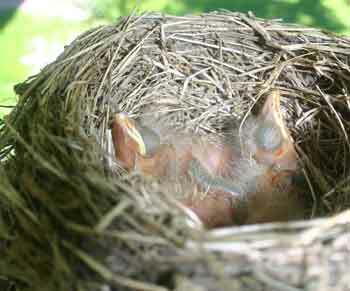 You can see how young they are because the red breast is not really real red yet. 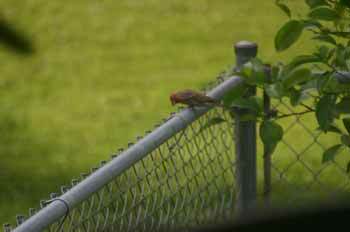 They sit on the fence and the mother (or maybe father) bird gets some seed from the feeder and goes to the fence to feed them. I’ll try to get some pics of that to post later this week. 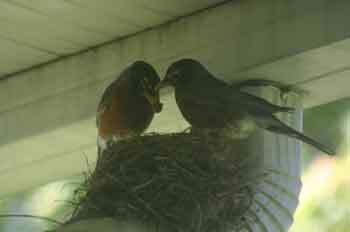 Those robin babies (or teenagers now maybe) are still so cute. They are very noisy about wanting food still. I’m so glad that they have come back around. 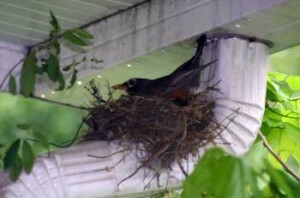 We’ve only seen the mom (or dad) and two of the babies. Hopefully the third is off on its own and doing well. 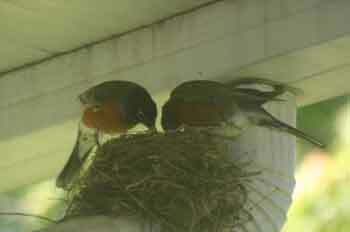 This little red headed guy and his bride have been looking at the old robin’s nest but haven’t decided to move in yet. Hope all of you are safe from storms and having a great week! Can you tell I love summer tomatoes? Arrange 4 tomato slices and 2 mozzarella slices on each of 6 salad plates. Sprinkle evenly with salt and pepper; drizzle with oil. Top evenly with basil. Six servings. 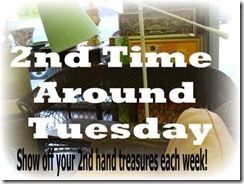 Join Tam at the Gypsy's Corner for Three or More Tuesday! 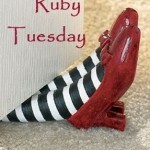 Join Mary at Work of the Poet for Ruby Tuesday! As promised, here are more pictures. 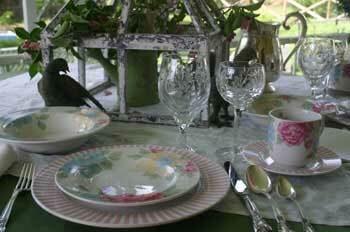 Today we are taking part in Outdoor Wednesday with A Southern Daydreamer. 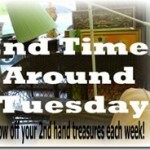 See more outdoor Wednesday by clicking on the pic above. My Mama used to make a similar version of this that I just loved with tortilla chips, enjoy! Mix all ingredients together well, adding the shrimp last. 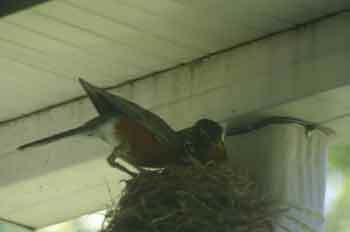 As you may recall, last Wednesday, I posted pics of our little robin in her nest. 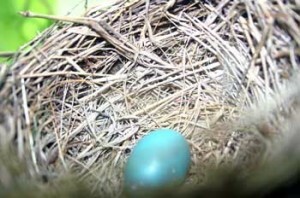 At that time she had two eggs. 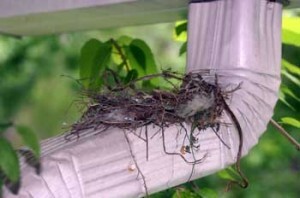 Since then, she has laid two more eggs for a total of four! She is a very good mother. 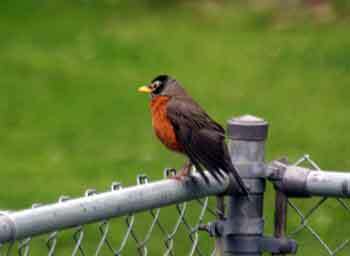 She runs off Blue Jays that get too near and is always on the watch for danger. She doesn’t seem to mind us. 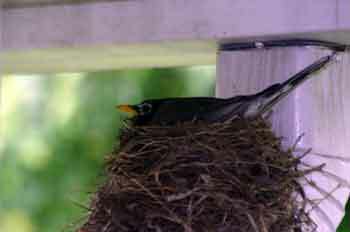 She is not real happy when we take pictures of her little eggs when she is out of the nest, but she poses very prettily for us when she is in the nest. 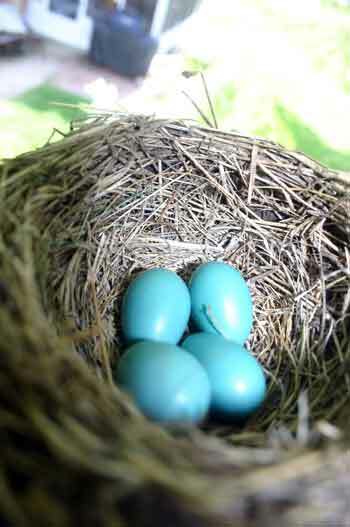 Here are the four beautiful eggs. 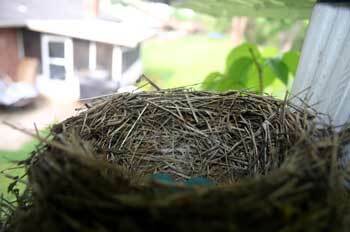 Here she is on her nest. 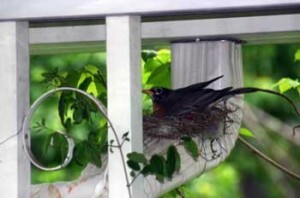 No bluejays allowed at this feeder! 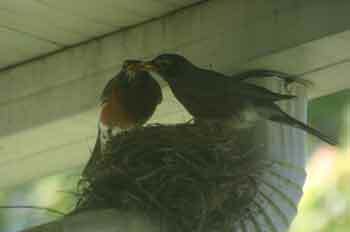 Won’t be long until we have little baby robins! 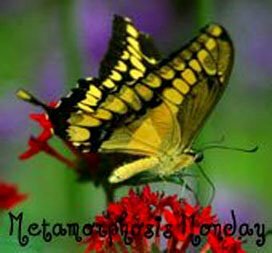 Enjoy the other outdoor pics with A Southern Daydreamer’s Outdoor Wednesday. I love olives and this is a great little bite! I’ve seen recipes with the olives stuffed with blue cheese, ham, garlic, cream cheese mixtures and more. They can be filled with a pastry bag fitted with a small tip. Just fill them however you like, bread them and then fry them. Heat about half an inch of olive oil in a large, heavy skillet over medium heat. Roll the olives in the flour, then, in the egg, then, in the bread crumbs. Fry the olives in batches until golden brown. Drain on paper towels. The cookbook then gives the recipes for these delights. 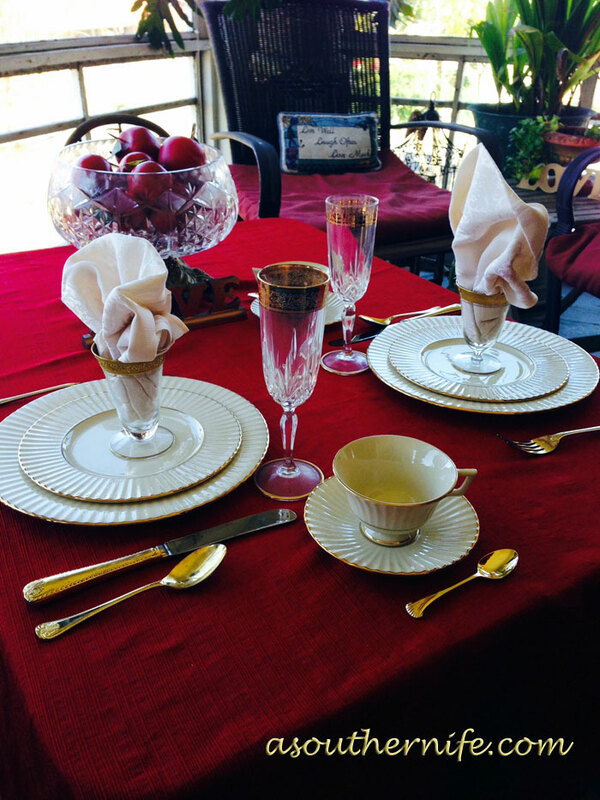 I’ll give you the recipe for the Eggs Sardou today. P. S. – I’m still getting around to visit all of the outdoor Wednesday folks. Eye Doc dialated my pupils and it really put a kink in things! 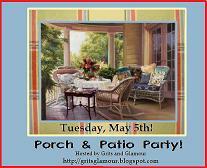 Today, I’m joining Barb at Grits and Glamour for her porch and patio party. You may be wondering what happened to the series on Southern food. Well, it’s still here. 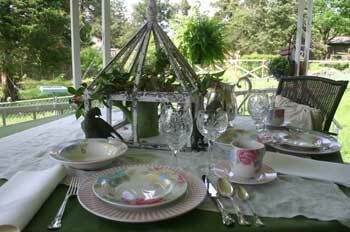 You see, porches and Southern food go together like greens and ham hocks. Back in the day, they didn’t have air conditioners. So, Southerners would often gather in the shade of the porch on Summer evenings after supper to enjoy the relative coolness of the evening. Remember, it gets blazing hot and very humid down South; so we are always looking for cool spots. 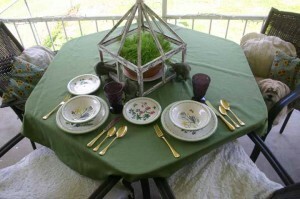 July and August are traditionally favorite times for church socials on the grounds, community barbecues and other outdoor gatherings that centered around food. The crops were already in the ground, and it was a good time for everyone to take a little bit of a break. Some of the favorites at these gatherings were fried chicken, deviled eggs, potato salad (a true Southerner knows to steer clear of potato salad that has been sitting out in the Summer heat). 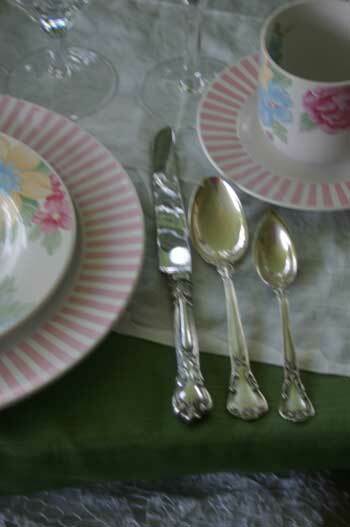 There would always be desserts and lots of sweet tea. One year, when I was growing up, my Mama and Grandaddy, decided to get some chickens to “process” in Grandaddy’s backyard. Now, the chicken I always ate came from the grocery store, and I really didn’t want to have anything to do with the actual “killing” of the chickens. When I told Mama this, she informed me that the dead ones were the only kind you could eat! Well, she’s right about that. 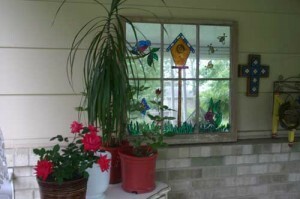 Here are pictures from one of my porches. 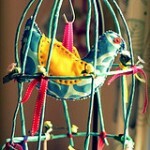 I still love to sit on the porch in the evenings, listening to the birds sing and enjoying the world. Of course, there will be recipes at the end! View from the yard. That's a bird feeder in the fore-ground. Lobelia and white petunias. There will be morning glory growing up that rail soon! 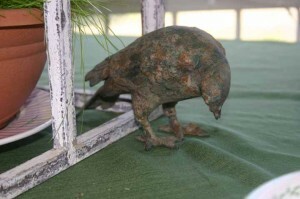 That is an old salvaged window fitted with mirrors and then decorated with gallery glass. This is my 2nd time around entry. Love how this worked out. Click on pic to see more 2nd time around entries. A place to sit and watch the birds. A place to pot flowers. 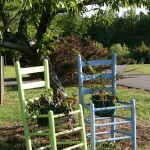 A place to sit and eat that good Southern food or read a good book. A closer look at the table. I like to change this out. Some greenery. 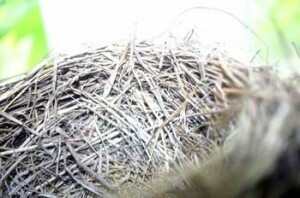 See the nest at the top. More pics of that tomorrow! Thanks for coming to the party on the porch. Now for some food! 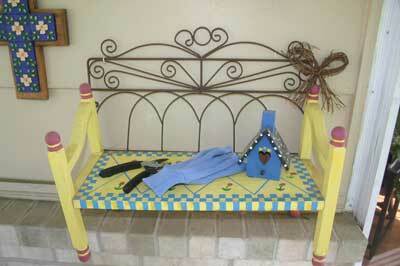 Knock out the seat, add a favorite plant and presto! 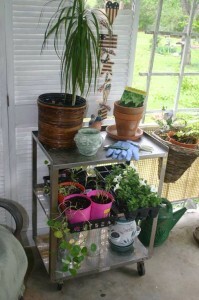 Punch a few holes, add plants and hang them anywhere. For plants, and lots of other things. 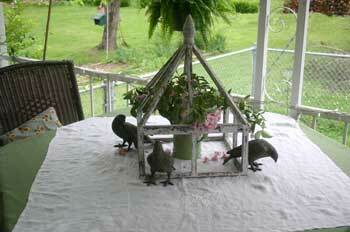 old candle holders which you could paint any color for your porch. Old lamps that you could remake into a candle stick. 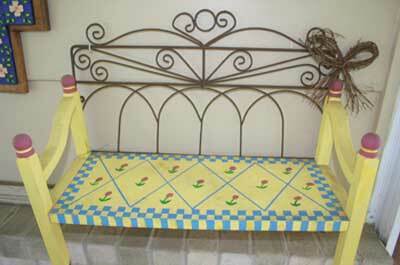 Old trays, you could repaint. 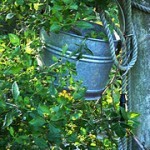 Anything you can use for a plant container. I could stay all day thinking of more ideas. What do you think? Biscuits that are as light as an angels wing. Sprinkle the yeast over warm water and sugar, and allow to stand 5 minutes. Add buttermilk. In a large bowl, combine dry ingredients thoroughly. Cut in shortening. Make a well in the center of the dry ingredients and slowly pour in the buttermilk mixture. Pat dough together and knead gently 10 times. Do not overmix or the biscuits will be tough. Roll out to 1/2 inch or 3/4 inch thickness. Cut out circles. Place on greased cookie sheets with biscuits just touching each other, closely spaced. Brush with a small circle of melted butter. Bake at 400 degrees F for 11-12 minutes or until lightly golden. We have been enjoying the porch all week. 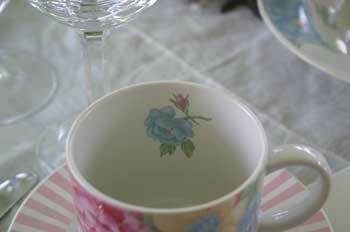 If you’ve missed it, check this weeks posts on A Southern Life. 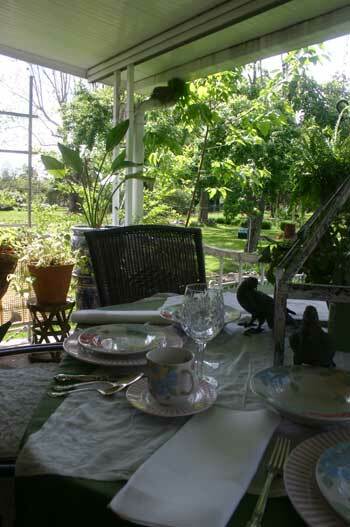 Today, we’ll have lunch on the porch. Yes, I braved the wind. 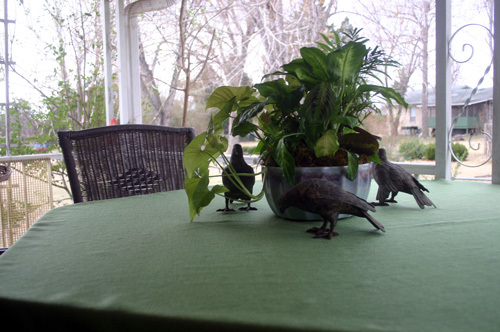 Sorry, it wrinkled the tablecloth a little, but, those things are okay when you are enjoying the porch. Y’all check out how my little dog, Bailey (the ham) managed to get in the picture. All ready for soup first, then an entree and bread. 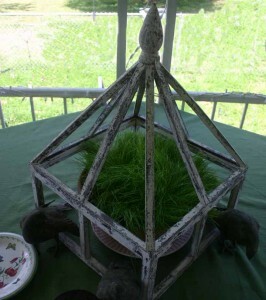 Wheat grass in a garden. 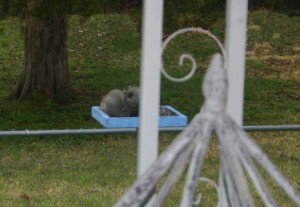 The squirrel is having lunch at the bird feeder. The dishes are Mikasa's Garden Bloom for Studio Nova. 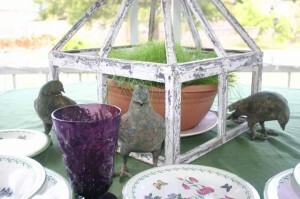 This bird is trying to hide behind the pretty purple glass. 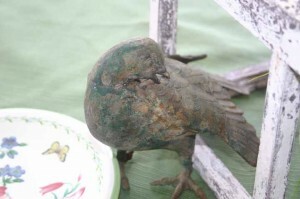 This bird thinks it has found something to eat. 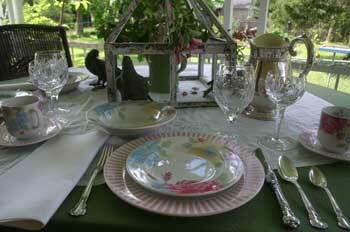 Wish you could all join me for lunch on the porch. Life is just better when you can sit on a porch. 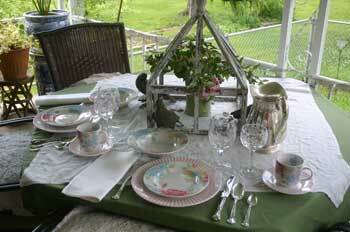 Ya’ll go on over and see the other great tablescapes at Between Naps on the Porch. This soup looks and tastes delicious and takes advantage of the abundance of Spring asparagus. 1. Melt the butter in a large pot over medium heat. Stir in the leeks and onion, and cook until tender. 2. Pour water into the pot. Mix in potatoes, carrots, asparagus, and rice. Season with salt. Bring to a boil, reduce heat, and simmer 30 minutes, until vegetables and rice are tender. 3. Stir spinach and heavy cream into the soup mixture, and continue cooking about 5 minutes before serving. 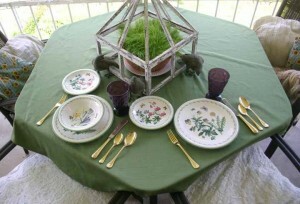 Here is a picture of the dogwood branches that I had originally planned to use for my Easter brunch tablescape. 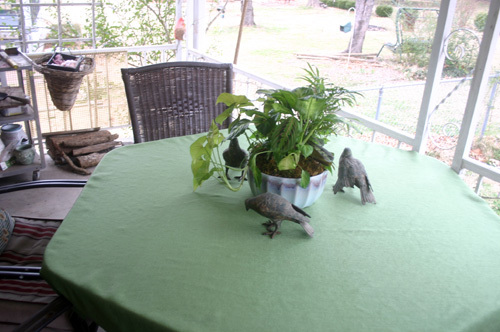 The table on the porch is big enough for them but the wind was not cooperating. 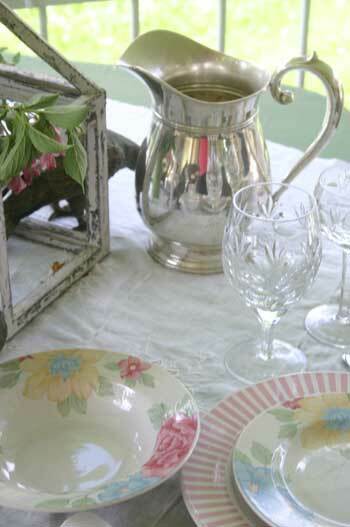 I caught the branches and turned the whole thing over and, of course, spilled water on my tablecloth. 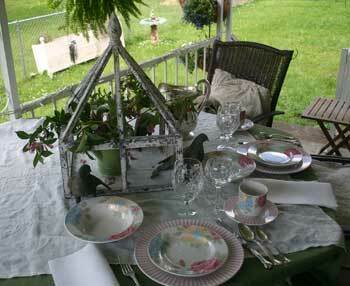 I ended up moving the tablescape inside and my table wasn’t big enough for this arrangement. 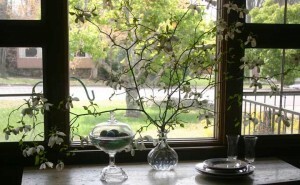 I thought the dogwood branches were pretty in this carafe and wanted you to see it. Sorry the pic isn’t so great. At least two exposures (sides of the house). 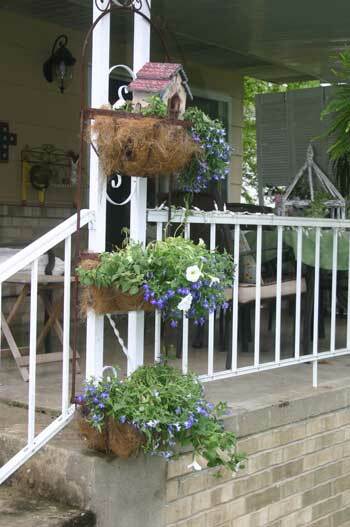 Hanging ferns or colorful flowering plants. 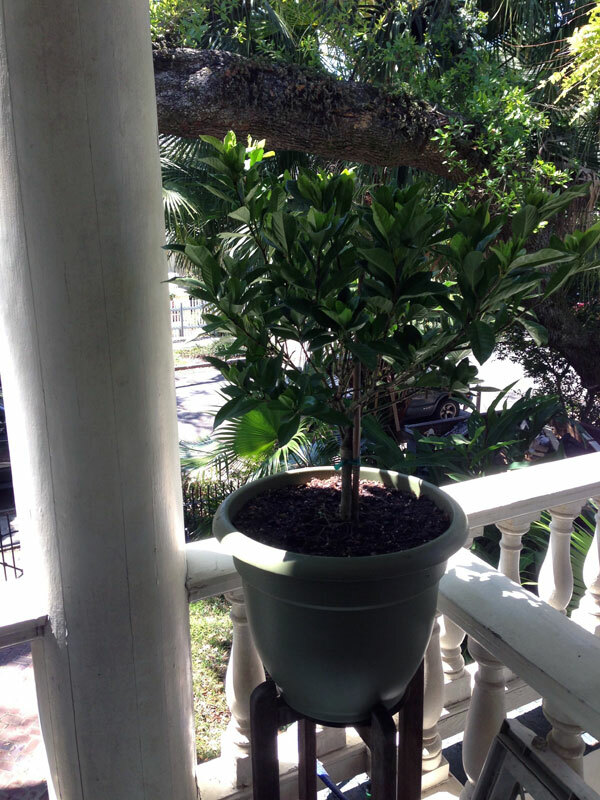 Definitely a porch swing…and creaky steps. 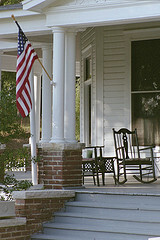 A good porch should have a loyal dog laying at the top of the front steps waiting to welcome friends and chase off others. Three cats are equal to a dog, if one is a Tortie. oh and who can forget a swing! And a screen door into the house so that you can open the main door and allow the sounds and smells from the kitchen spill out onto the porch! A crumb top apple pie served with sweet milk and followed up with some ice cold sweet tea! mmmm…. Fried chicken, green beans, yellow squash, cornbread sticks and baked apples. Grandma always had something cooking. Blackberry cobbler was my favorite. She would send me and my cousin out to pick them earlier in the day. I loved all of these responses and just had to share them with you. 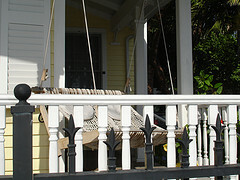 What do you think a good porch MUST have? I found this posted by Elise on Simply Recipes and thought it would be great to make to drink on the porch. My mama makes great lemonade. I think she will like this recipe. Hope everyone had a wonderful and blessed Easter weekend. We had a beautiful day here on Saturday and then rain on Easter. 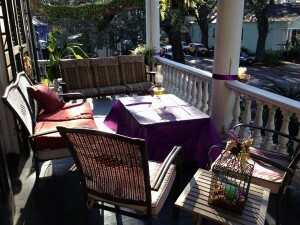 I took advantage of the lovely weather on Saturday to get some work done on the porch. I’ll sit out on the porch anytime I can. We always have some days in the Winter when porch sitting is comfortable, but, when Spring comes around, it is time to get serious. A porch is very important to Southerners. Even if we don’t have a porch ourselves, we tend to gravitate to someone who does or remember a favorite porch from our childhood. I’ve talked before about sitting on my grandmother’s porch helping her snap beans. That is a favorite memory. Comfortable seating. 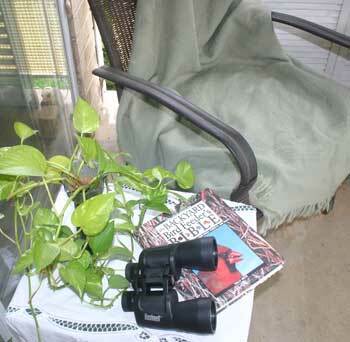 Your really need a good comfortable chair to sit and read a good book, watch the birds (or in my case, also the squirrels) at the bird feeder and other wildlife. You will need more than one chair so you can invite a friend or two (or more) to join you. Dallas ferns. This is a personal preference for me, but, I love the look of big fluffy ferns hanging from the porch. 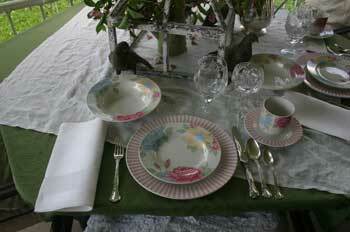 A table. 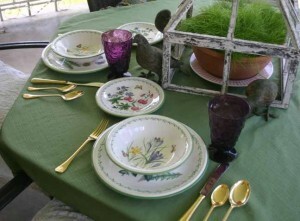 Large enough to hold supper for your family or small enough to just be able to hold a cool drink, you must have a table. A good fan. 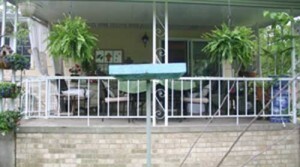 Ceiling fans, stand alone fan, tabletop fan, whatever you have, you need a good fan on your porch. The Summers in the South are brutal but an evening breeze with a boost from a fan can work wonders. These are the essentials for me. I think the best porches server multiple purposes. A place to entertain, a place to read, a place to watch nature, all from one place. 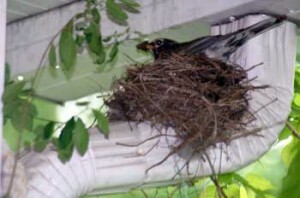 My porch is always a work in progress. I am always moving things and changing things around. If you don’t have a porch, you can enjoy mine. 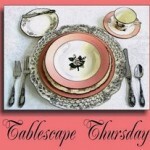 You saw a corner of it in the Tablescape Thursday a couple of weeks ago. I’ll be sharing more of it with you eventually. I would love to hear what you think a porch must have. Let me know in the comment section and we can all share our ideas. Go out and make this a great week! These are from a 1964 edition of A Cook’s Tour of Shreveport by the Junior League of Shreveport. Grate cheese into butter and cream well together. Add salt and cayenne, then work in flour until well blended. This takes a good while, and a lot of “working.” Knead on board until smooth. Roll into a long, thin roll and put into refrigerator and chill thoroughly. When chilled, slice in thin slices and bake on an ungreased cookie sheet in a 350 degree oven until slightly brown, 8 – 10 minutes. dust with powdered sugar. Christi’s note: while it says they may be kept indefinitely, I wouldn’t advise it.